It's time again for another Shopping Our Stash Challenge and we really have an easy theme for you this time. Pick a sketch - it can be an old one or current - create your project but be SURE and give a link to the sketch you're using! See, I told you it was an easy one! Check out our blog for all the details and see all the inspiration from the Design Team. Don't forget to use up that "stash" and let us know what you used! 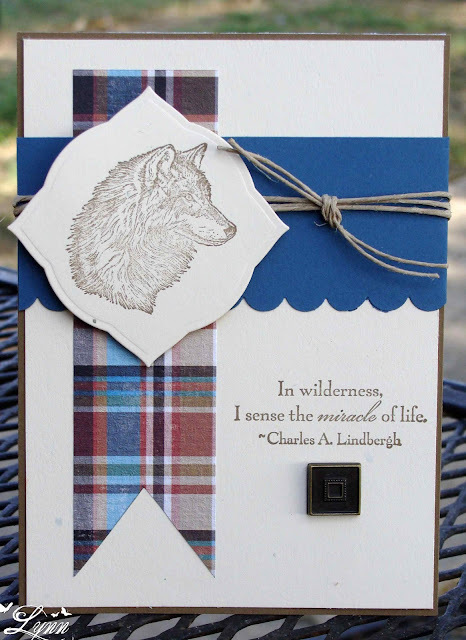 My card features the In Wilderness set from SU and I used the sentiment and the image of the wolf. I haven't used either one of these in a while. The card base is done in Soft Suede and then Confetti White (kind of speckled type vanilla) - don't think I've ever used that but have a whole lot of it! 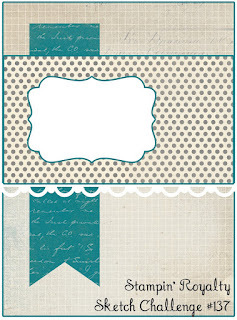 The DP is from Paper Studio and I added the twine and a square brad I had. After snapping a pic of the card I realized it would have looked better if I'd added a little stitching to the blue panel or embossed it or something....but, it was done and was not going to let me un-glue it for any reason! LOL! The sketch I used is a current one from Stampin' Royalty (love it) and so I'll enter this in their challenge. Thanks for stopping by............and check out the Shopping Our Stash Challenge. Beautifully done. I don't undo things either :-). Great sketch too. This is a great card Lynn... a perfect 'guy card'. Fab image and I like that plaid paper! I love the sentiment on this one and the paper is lovely. Lyn, Love this card. That is one of my favorite images for a manly card. Love that plaid paper and your brad and twine are great additions. I'm going to see if I can start to add this challenge to "Things To Do" list Have a great day. Awesome masculine card Lynn! I love that wolf image and your added twine!! Fantastic quote! I happen to love it as is - love the wolf in profile, and that fab square brad (man, I think I might still have a couple of those...must check!) and the great plaid piece! Oh, this is a fabulous challenge this week, especially since I use lots of sketches from lots of different places. I'm pretty sure I can get something done for it. I am loving this Wilderness set more and more as I see cards you've done. Despite swearing I wasn't going to buy more rubber stamps because they take so much storage space (sigh), I may break down and get this set. But just this one! :-D Love the plaid dp! Lovely card Lynn and I love, love the sentiment! Awesome!! I love the plaid dsp and that pretty blue with the twine! Great card for the guys! Lynn - Great card! Such a beautiful stamp from SU. Love how you used some embellishments on a masculine card and its still masculine. The twine and brad add some visual texture. So nice!! Such a neat card! I love the pop of blue and the great wolf image. WOW - love the clean lines of this card, and the minimal embellishment. This is such a pretty masculine card. Love that plaid accent. Adds some color without being frilly. Beautifully done- LOVE the sketch and the DSP- and love the image! Hi Lynn! Great sketch. GREAT card! Very masculine, kinda CAS and I love the plaid and that brad! Isn't this a fantastic sketch? I love the bright blue and the plaid. They're just perfect with the wolf sketch! The twine is a great finishing touch. The image, paper and twine work so well together and I LOVE that square brad! !